New York, March 2017 — Kamber Management Company, a New York City–based owner and operator of commercial real estate, announced that the renowned architectural firm Pei Cobb Freed & Partners has been engaged to create and implement the reimagining of Tower 45. Tower 45 is a modern Class A 458,446-square-foot, multi-tenant office building located at 120 West 45th Street in the heart of Midtown Manhattan. The capital improvements will include a renovated lobby and reimagined atrium by Pei Cobb Freed. Built in 1989 and originally designed by Swanke Hayden Connell Architects, Tower 45 is a 40-story building featuring boutique-sized, virtually column-free floorplates ranging from 9,304 to 13,318 square feet, allowing for open and flexible layouts for office tenants. The building possesses a number of physical features that enhance its status as a premier boutique office asset. Tower 45 offers numerous options for office tenants from 13,318-square-foot full floors to customized pre-built suit spaces ranging from 1,500 to 6,500 square feet. With Pei Cobb Freed, the property has begun a multimillion-dollar capital improvement program focused on the building infrastructure and reimagining common areas. Ideally situated in a prime Midtown location, Tower 45 is in immediate proximity to Bryant Park, Rockefeller Center, and Fifth Avenue. The building is located within short walking distance from the Grand Central Terminal and Times Square subway hub. Its central location is among the area’s greatest concentrations of major corporate headquarters, with particular focus in the financial services, media, and legal sectors. Kamber Management Company is a third-generation, family-owned company established over 75 years ago that invests in, owns and operates commercial and retail real estate assets. Kamber Management manages and leases the family’s real estate interests, as well as a broader spectrum of investments. The firm’s portfolio consists of more than 1 million square feet of office and retail space in New York City, Long Island, Connecticut, Maryland, Illinois, North and South Carolina, Texas, including its new flagship property, Tower 45, a 458,446-square-foot Class A office building in Midtown Manhattan. Avison Young is the exclusive leasing agent for Tower 45. 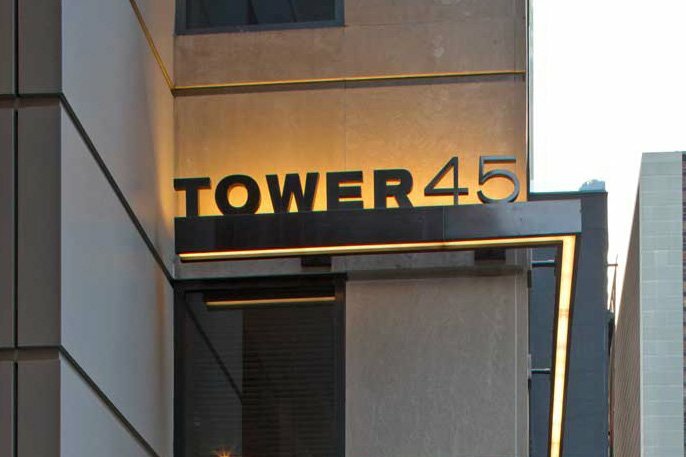 For all Tower 45 leasing inquiries, please contact Mitti Liebersohn at mitti.liebersohn@avisonyoung.com. With projects in progress in North America, Europe, the Middle East, Asia, and Australia, Pei Cobb Freed & Partners is a leader in architectural design and sustainability. Across six decades of exceptionally diverse practice, the firm has completed building and planning projects in more than 100 cities around the world. Working from a single studio in New York, the firm is consistently recognized for excellence in design and sustainability, with 200 major design awards, including 24 AIA National Honor Awards. Detailed information about the firm and its work can be found at pcf-p.com.